A book titled, ‘History of Maryul Ladakh’ by Tashi Rabgais in English version was released by Gyalmo Diskit Wangmo, Former Member of Parliament, Ladakh on September 18 at the Conference hall, Grand Dragon Hotel. 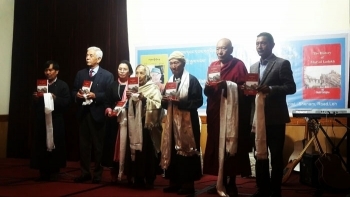 The book was translated from Ladakhi language into English by Sonam Gyatso, grandson of Tashi Rabgais. Chewang Phuntsog, Former Chief Secretary of J&K termed Tashi Rabgias as the ‘Grand Old Man of Ladakh’. Speaking about his own personal association with the writer, Nawang Rigzin Jora, MLA said that the contributions made by Tashi Rabgais in the field of culture are immense. He besides being a historian is equally an acclaimed master of Buddhism and Buddhist philosophy. He expressed sadness that the Ladakhi society which is now heading towards an individualistic and self-concerned way have forgotten to respect and admire the person who played a pivotal role in shaping the destiny of the society. Reviewing the book, Dr. Nawang Tsering said that the book is written in a lucid manner and will help to understand the glorious history of Ladakh. Also, gave a call to read the book by every Ladakhi to understand the chronology of kings and events of the former Ladakhi Kingdom. A galaxy of Ladakhi writers, scholars, dignitaries, friend and relatives of the writer pleaded Government of India for conferring Padmashree award to Tashi Rabgais. He in a very skillful manner nourished the under privilege society of Ladakh for more than half a century through his literary works. Nawang Tsering Shakspo, Former, Chief Editor of Jammu and Kashmir, Academy of Art, Culture and Language, Leh termed Tashi Rabgais as the ‘Maker of modern Ladakhi literature’.